The Lares Valley is one of the most picturesque in southern Peru, home to high alpine lakes, snowcapped peaks, and traditional weaving and farming communities. Our trip also features hiking within the Machu Picchu sanctuary, including a beautiful section of the classic Inca Trail to the famous Sun Gate. Day 6-7: Machu Picchu tour, then free day at the site. Day 8: Flight to Lima / Departure day. This morning our Lares Valley trek begins. By private transport we make our way from Cuzco to the Sacred Valley of the Incas and the town of Calca. From here we head up into the mountains on a spectacular road, finally arriving at Lares Pass at 4470m for the drop into the Lares valley. In Quiswarani village, the stating point of our trek while lunch is being served our horsemen will prepare the equipment for our 42km/26m trek. Our trekking over the next three days offers spectacular views of several peaks over 20,000 ft., passing by pristine glacier lakes and remote native communities. Visits to these native communities are a special feature of the Lares Valley trek, as we learn about the weaving and shepherding traditions of these villagers. 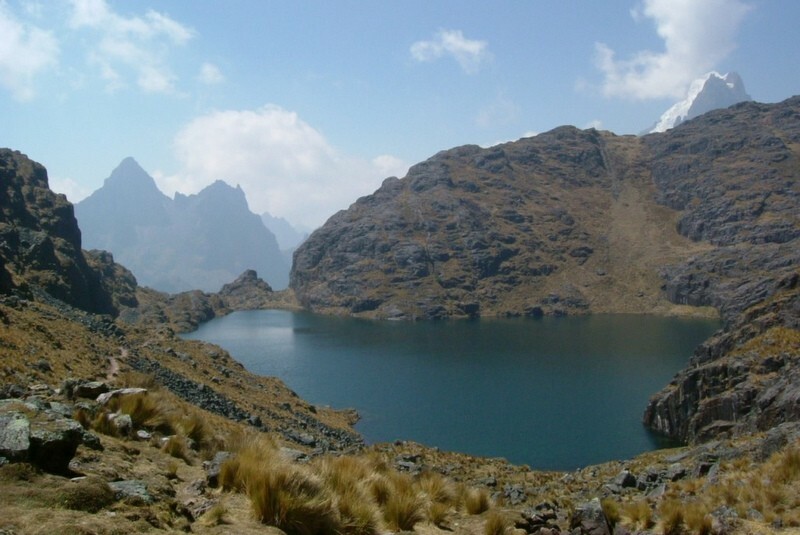 This afternoon we will ascend to the beautiful Queuña Qocha lagoon and tcontinue on to Huillcapunku pass (4400 m.a.s.l. ), At the top of the pass we will eat lunch while taking in more spectacular views. Then we will continue hiking until we reach our first campsite in Cuncani Village. Estimated hike time 6-8 hrs a day. Today will be another amazing day hiking in the Andes mountains of Peru! Early in the morning we wake up and have breakfast. Then our hike begins and we walk for approximately 4 hours until we reach Chaqchapata where we will have our lunch. After we eat, we will continue the hike for about 2 more hours until we get to the Aruray pass (4450 m.a.s.l. ), here we will be able to see the beautiful scenery with snow-capped mountains and and a truly amazing lake. From this point we will descend to walk by two lagoons and a Polylepis forest. There is a significant change in the scenery before we arrive at our beautiful campsite in Mantanay approx. two hours later. Estimated hike time 8-9 hrs a day. After breakfast we will descend to Yanahuara village, in the Sacred Valley, where we will have lunch and also meet our private transport for a short drive to the Ollantaytambo train station where we will hop the train to the town of Aguas Calientes. Here we will enjoy dinner in a traditional restaurant and spend the night in comfortable lodging. Tonight you can visit the medicinal hot springs on your own if you wish. Estimated hike time 4-6 hrs a day. Sunrise at majestic Machu Picchu! Known as one of the greatest architectural achievements in the world, this historic sanctuary is considered one of the seven manmade wonders of the world. After a guided Machu Picchu tour, take your time and enjoy this magnificent place. After your tour you might like to visit the local hot spring. Overnight in Aguas Calientes, the town below Machu Picchu. The extra day at Machu Picchu can be dedicated to day hiking the many miles of Inca road surrounding the site or just relaxing and taking in the views. During peak visiting hours (10-2), try a hike on one of the surrounding Inca trails on Wayna Picchu or Machu Picchu Mountain. Return by train and car to Cusco in the evening. Morning flight from Cuzco back to Lima and a free day in Lima or our included city tour. International flights may depart any time after 2pm. The Sun Gate/Lares Trek is an eight day tour which includes a moderate trek as well as walking around ruins and during city tours. No trekking experience is required, but one should be in average physical shape and not suffer from any heart or respiratory conditions. As always, a certain patience is required for the inconsistencies and occasional delays of developing-world travel. This tour includes 3 star hotels. We would be happy to give you an upgrade to four or five star, please ask then we can work it into your custom itinerary. During our trek, mules will accompany us to carry most of our things, including all the camping gear. Each passenger is allowed 15 pounds / 7 kilos of personal items which will be carried by the mules. Such items would include warm clothing for camping, toiletries, etc. During the day you’ll be using a your daypack and will just need to carry water, snacks, rain gear, and a layer for changing weather conditions. Of course most people also carry a camera. It is best to bring from home such items as prescription meds, eyewear and care, unusual film and camera batteries. Please bring all used batteries home to recycle! Lares Trek: days are warm if sunny, slightly chilly if cloudy, but you probably won’t be cold while hiking. Nights are cold, and there is always the chance of rain.